Klein Waterval offers professional and personal service with a relaxed and friendly farm atmosphere. 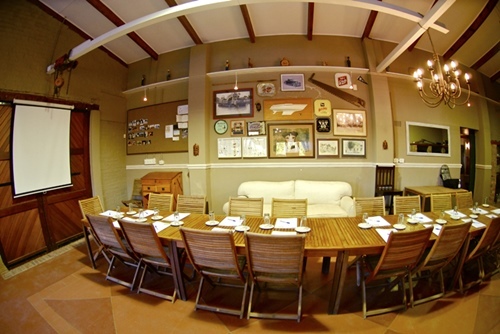 The Conference room opens onto a wooden deck that overlooks vineyards and spectacular mountain views. 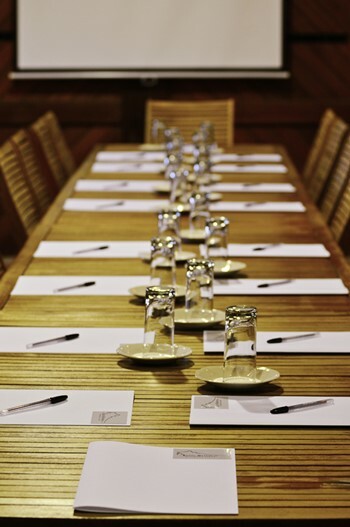 The venue seats up to 45 delegates with basic facilities and break away rooms. Conferences can only be during the months from April to October and are subject to availability. Please note our kitchen is neither Kosher nor Halaal, but we are able to provide such catering from our Halaal Caterer on request and at an additional cost. Should you require additional equipment; it will be sourced at client's expense. Final numbers of delegates must be confirmed at least 4 working days before the conference. Tariffs are subject to change without notification. All tariffs listed above are inclusive of VAT. A deposit of 50% is required to confirm the reservation. Deposits are refundable subject to our cancellation policy. Full refund of the deposit if cancelled prior to 30 days before the day of arrival. Conferences cancelled from 30 to 15 days prior to arrival date will forfeit 100% of the deposit. Conferences cancelled less than 15 days prior to arrival carries a 100% cancellation fee on the full booking value. Applicable cancellation fees may be charged to the provided credit card details. These terms apply irrespective of whether deposit has been paid or credit card details have been provided. Refunds may be subject to bank transactions a fee. In the event of a premature departure or no show, the full extent of the stay as originally booked and confirmed will be charged. All reservations and cancellations to be made in writing by fax or e-mail. Please note that we do not offer credit facilities and the balance of the account must be settled promptly, on departure. We invite you to visit to telephone us to discuss the specific requirements for your conference. Alternatively, please send us an ENQUIRY, stating your requirements. We look forward to you experiencing our country hospitality!